1. Anyone who sees, discovers, or distinguishes; such as, an observer. 2. Someone who knows and judges or who has the power of distinguishing: "He was a great observer and discerner of men's natures and humors." 3. 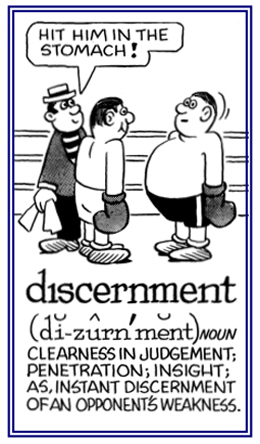 That which distinguishes or causes understanding. 1. In an obvious way or to a noticeable extent. 2. In a manner to be seen or discovered; visibly. 1. 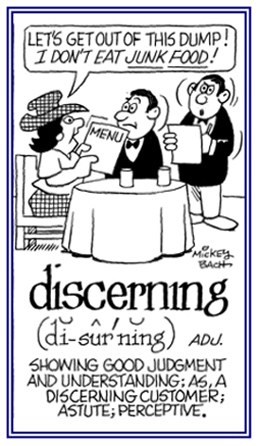 A reference to good judgment and good taste: A discerning mind is known to determine the best way of doing something. 2. Descriptive of showing keen insight and making good decisions: The discerning mechanic was able to quickly determine what was wrong with David's car when it wouldn't start and to fix the problem. © ALL rights are reserved. To deprive of status as a church, or of membership in a church. Showing page 8 out of 35 pages of 513 main-word entries or main-word-entry groups.